I make books because I believe it is essential to create places to record what we want to remember or explore further. Of course technology can do this just fine but I love the old school nature of books – their permanency and their physicality. All workshops are fully hands-on and suitable for those without experience unless otherwise mentioned. Equipment and materials are all supplied plus delicious snacks and lunches for full day workshops..
A day of Paper and Pigment. 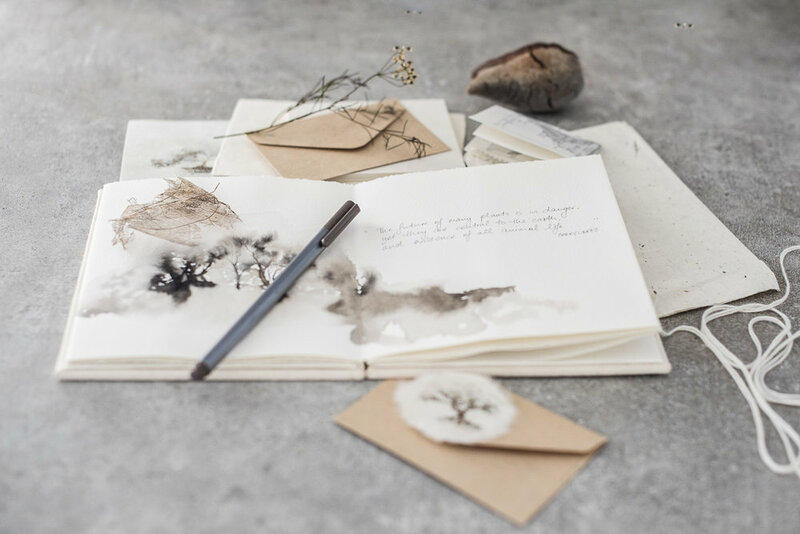 Using beautiful, high quality papers, ink and watercolour, be guided in folding and binding an accordion style artist book, then after lunch, fill it with watercolour inspiration from natural bushland surroundings at Eramboo. Sat 4th May 2019. Eramboo Artist Environment, Terrey Hills. Bring your paper treasures (tickets, letters photographs, stamps etc) and make a stunning pocket accordion book in beautiful archival paper - perfect as a display or as a safe heirloom keepsake to tuck away. Sunday 23 June 2019. The Lost and Found Dept, Hunters Hill. Gather a minimum group of 8, find a date and lets design a book making class especially for your people and your interests. Great way to spend the day with family, friends or colleagues for a special event or just because!